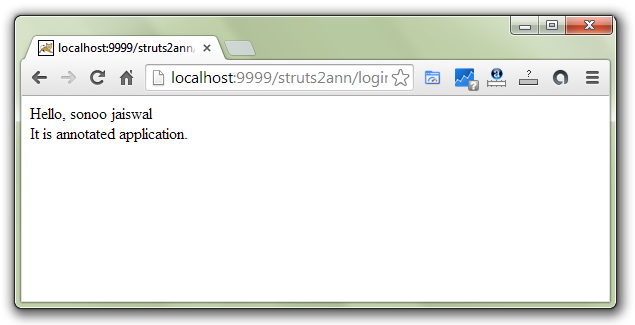 Struts 2 provides you convenient way to create struts application using annotations. So, there is no need to have struts.xml file. 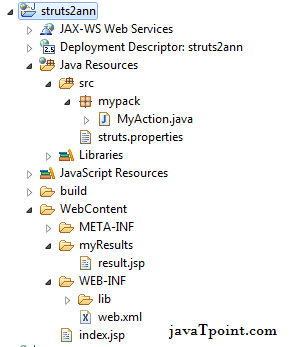 As we have said earlier, there are 2 ways to use zero configuration file (no struts.xml file). 1) @Action annotation is used to mark the action class. 2) @Results annotation is used to define multiple results for one action. 3) @Result annotation is used to display single result. Let's have a look at the directory structure first. 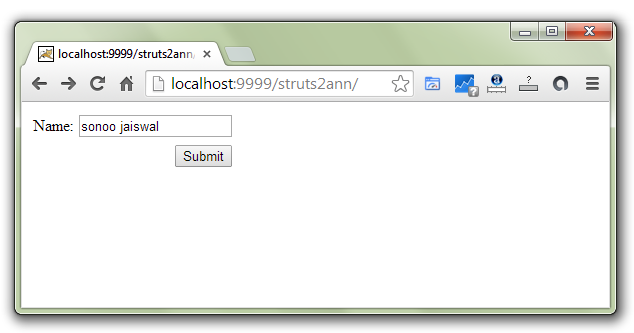 This jsp page creates a form using struts UI tags that receives name from the user. This action class uses the annotations for the action and result. This jsp page displays the username. <%@ taglib prefix="s" uri="/struts-tags" %> Hello, <s:property value="name" /> It is annotated application.